Cleaning your fuel injectors can seem like a daunting task, especially if you’re not a mechanically-minded driver. Plus, a lot of drivers don’t actually know what they are, what they do, or why cleaning them is so important! No matter what kind of driver you are, and regardless of your expertise, this guide is here to help you! We’ve put it together to help you get a solid grip on everything you need to know about them. We’ll talk you through the job they serve in your motor, we’ll explain how they get gunked up, and look at a few different options for getting them clean. To get started, we’ve put together an easy primer on them, and why they’re important. These are the motor components responsible for feeding fuel into the motor. They have narrow nozzles which shoot pressurized gasoline or diesel into the engine’s combustion chambers. Each one has a specially-designed nozzle which projects a tuned spray. The shape of the spray is engineered to a fine degree by the manufacturer, so that it works optimally with the specific motor. Once it’s sprayed into the intake manifold, it reaches the optimum blend of air and petrol to support combustion. Finally, the blended air and gas molecules hit each the combustion chamber, where the mix is burned. Basically, these highly-engineered nozzles transform the petrol stream from a splashy drip to a fine spray, which burns much more powerfully and efficiently. If you want to get super scientific, that’s because the finer droplets offer more surface area, and therefore more contact area between oxygen and gasoline. They’re the main reason why modern vehicles perform so reliably as opposed to older carburetor models. Fuel injectors provide a big boost over older carburetor systems in a few different areas. They provide more power, since every cylinder is getting the perfect balance of air and fuel to fire properly. They also provide better efficiency and emissions, since fuel burns at optimum conditions. A clean, well-maintained injector sprays a clean, even cone of aerated fuel into the combustion chamber. However, as soot and carbon build up around the edges of the combustion chamber and on the nozzle itself, that perfect cone gets a bit wonky. A dirty, gunked-up component produces an uneven dribble or erratic spray which doesn’t give your motor as much combustible surface area to work with. That’s when you start to see issues with performance! Even the most refined fuels aren’t perfectly clean. As they run through your system, they can leave carbon and soot deposits behind in your engine. While most of the soot gets left in the combustion chambers, they are often the casualty of carbon deposits. Worse still, most fuels at the filling station these days aren’t pure petroleum. They’re supplemented with ethanol and other lesser additives, which are even dirtier. Ethanol is particularly bad for them, since it leaves lots of carbon deposits and gunk behind. Diesel fuels are also quite dirty, and have less consistent quality. Premium fuels have detergents already in the mix, which is why we recommend spending a bit more for them. You’ll be looking at cleaning your injectors far less often when you use these grades. Still, they can’t keep your nozzles completely clean. And with lower-quality fuel grades, you’re looking at a steady accumulation of carbon and soot. So, with every tank of fuel, they get dirtier and dirtier, and your performance starts to take a hit. 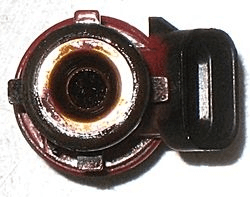 What do dirty injectors mean for your vehicle? The spray patterns produced by these nozzles are designed very particularly. If they have buildup from carbon or soot, they can start spraying off-kilter. That means fuel isn’t hitting the combustion chamber the way it’s designed to, so you’ll usually see a drop in performance. Gunked up components mean lower power, lost horsepowers, poor starting torque, and lower fuel economy. 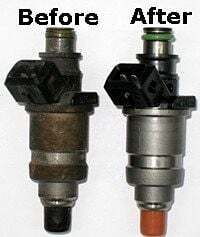 Clogged injectors mean some serious loss of power, and eventually some big repair bills (sometimes in the thousands of dollars). Eventually, you’ll see a “check engine” light, and probably notice some very tangible symptoms. The usual warning signs of dirty ones are a rough idle, trouble starting, low starting torque, and decreased mileage. You may also hear motor pings, or some hesitation with the throttle drop-in. A lot of people learn about the importance of cleaning fuel injectors the hard way. We’re here to give you the lowdown in advance, so you don’t run into these problems! If your car has any of the symptoms we’ve mentioned, or is suffering from a general drop in performance, it’s definitely worth giving them a cleaning. So, now that we know a bit more about them, let’s talk about some of the options for keeping them clean! The simplest solution for cleaning them is to do so indirectly. You can buy any number of solutions that you can pour right in your gas tank. As you drive through that tankful, the cleaning solution will get to work on nozzles. All without you having to do anything besides pouring the can into your tank! You don’t have to have any mechanical know-how to use them. All you need to be able to do is open your gas cap, pour, and drive! By contrast, direct cleaning requires you to know how to get into your engine, and probably remove components. That can be a tricky procedure, and you risk making mistakes which can damage engine parts. They’re not time-consuming at all! Fuel line cleaners are insanely easy to use, and since they work as you drive, you’re only adding a minute or so to your routine. That’s as opposed to an hour of intensive work to get into your motor to clean or replace parts. Unlike direct cleaning, indirect cleaners work on other engine components. Because they’re run through the fuel line, they’ll touch every component along the way, and keep them all free of deposits and corrosion. Many fuel-line cleaners are concentrated so that you only have to use them every few thousand miles, or at oil changes. That’s barely any money or time to add to your maintenance routine! There are also less-concentrated fuel-line supplements that you can use with every tank (such as the Lucas). If you like to get all your cleaning done and then forget about it, you can choose a very concentrated solution that’s used every oil change (like the BG 44K). If you prefer a preventative approach, and want to keep deposits from forming in the first place, buy something that works with every tank to keep things spick and span. They include a blend of detergents and lubricants just like the concentrated solutions, but with the goal of optimizing each tank of gas. That’s why indirect cleaning is good option for people who prefer preventive maintenance. Direct cleaners do a great job, but they don’t keep deposits from forming. These methods just remove built up deposits every so often, much like a single-dose fuel-line cleaner. If you buy a cleaner that goes in every tank, you can keep deposits at bay. Fuel line cleaners that go in each tank of gas are also a good solution for people who don’t have a reliable source of fuel. While these low-concentration solutions might be unnecessary for people who use branded, high-end gas (since those fuels have detergents already integrated), they can be a great way to compensate for mixed-quality or unreliable fuel sources. That makes them especially good for drivers who are on the road a lot. There’s a lot of flexibility here, which makes indirect cleaning easier to fit to your own preferences. They can make a huge difference in your engine’s performance for a very low price tag. A powerful single-use cleaner can can improve your power, efficiency, and reliability in the time it takes you to drive through a tank. This is the stuff mechanics use, and it’s as powerful as they come! BG-44K packs a ludicrous amount of detergents, and it’s not all that expensive compared to some of the less-effective options. It’s our go-to solution for vehicles that need an intense scrub-out. See our full review of the BG 44K by clicking through to our guide to the best fuel injector cleaners here. The Lucas solution is a classic, and you can find it sold practically everywhere. For good reason, too. It’s inexpensive, effective, and very user-friendly. Keep a gallon in your trunk, and pour a dose in after you fill up. This isn’t something to use for an initial treatment, but it’s a fantastic maintainer for relatively smooth-running rides. Find our full review in our guide to the best fuel injector cleaners! If you’re a diesel driver, you can find our breakdown of the best diesel injector cleaners in our special guide here! It can’t help you with worn components. Over time corrosion and deposits from your fuel will wear out some key parts. Each spray nozzle usually has a filter, a pintle cap, and a few o-ring seals. These rubber parts deteriorate over time as they’re exposed to fuel, and they can also be magnets for carbon or soot buildup. Indirect cleaning can’t always clean the cracks in between the injector and these little components. Plus, if your seals and caps are worn out, it may still spray unevenly. Direct cleaning and component replacement are the only ways to address those more severe issues. You can’t test your injectors to figure out if your components need to be replaced. The best way to figure that out is to use a direct cleaning kit with a pressure gauge and couplings. While a concentrated indirect cleaner can make a huge difference on an old car, you might need to take old ones out and soak them directly in the cleaner to get all the years of accumulated junk off. It’s not quite as thorough as direct cleaning. With indirect cleaners, you’re diluting cleaner in a whole tank of gas, so it’s not as concentrated as if you were to apply it directly. Also, direct cleaning kits allow you to apply the cleaner at pressure, which can be more effective at blasting out deposits from the nozzle. Fuel-line cleaners are an ideal choice for people who aren’t gearheads, and who don’t have the expertise to get down and dirty with their engine. They’re also perfect for people who pride themselves on being meticulously on top of their car maintenance. If you’re the kind of person who would rather take a preventative measure to avoid the whole problem, year-round fuel line cleaners are the best choice. However, these cleaners aren’t quite as thorough or fool-proof as direct cleaning. Use them with confidence, but don’t expect miracles! If you’re a confident DIY mechanic, you might think about doing some direct cleaning. Direct cleaning is a surefire way to get every last molecule of soot and carbon, and to make sure components are working every bit as well as they can be. Direct cleaning involves applying undiluted cleaning solution, and servicing components that need to be replaced or adjusted. Direct cleaning does the most thorough job, since it gets cleaner right onto the surfaces. Plus, the cleaner isn’t diluted in a full tank of gas. It’s much more concentrated, which means it can clean more effectively. Direct cleaning kits usually consist of a tank, hose, and fittings. You’ll add a concentrated cleaning solution to the tank, fit the hose to your injector rail, and spray. Many kits also have pressure tools which allow you to actually spray cleaner through the injector nozzle, which means you can blast out even the most hardened deposits. Since direct cleaning is more aggressive, it’s the best choice for older, dirtier engines which haven’t had their nozzles cleaned before. A cleaning kit will help you clean with a little more oomph than a fuel-line solution. It’s also the best, most foolproof way to improve your car’s performance, since you can assess components and test the actual spray of the head. Once you’re actually working in the engine bay, you’ll be able to tell if seals need to be replaced, or if filters are clogged. In addition to the tank, these kits also come with pressure gauge fittings. If you’re noticing dropped pressure on a clean injector, for instance, you’ll know it’s probably time to replace an O-ring seal. You’ll need two things to do a good job cleaning injectors directly: a concentrated cleaning solution, and a toolkit to apply it. We’ve got reviews of several kits and our favorite cleaning solution in our guide to the Best Fuel Injector Cleaning Kits! Find in-depth reviews of both the Berryman solution and the OTC kit in our dedicated guide to kits! These direct cleaning kits require a certain level of mechanical expertise and confidence. If you don’t know your way around a tool bench and your engine bay, you might not want to try the direct cleaning approach. We recommend these kits only to confident DIY mechanics. Of the approaches we’ve looked at in this guide, using a kit is the most intensive process. It’s time consuming, and it requires you to have a nice garage space to spread out with your tools. One downside of using these kits is that they don’t clean the rest of your engine components. You’re just servicing the injector itself, and you’ll need to use a different cleaner to deal with the manifolds and other components. And, finally, these kits are pretty pricey to purchase. They’re not too much more expensive than other tool sets, but a nice kit will run you a few hundred dollars. If you want to do a more thorough job on your injectors and engine components, but don’t have quite the confidence to go the direct cleaning route, we’ve got a third option for you. This kit from 3M is a nice compromise. It includes a powerful fuel system cleaner that you can run through the tank, and it also comes with two direct-cleaning cans which you apply directly to the throttle plate, carb, and intake manifold. This requires a bit more expertise than just throwing some cleaner in the tank, but you still don’t have to take apart the engine or remove the injectors. The direct cleaners spray as you run the motor, so they work their way through the system without you having to do any work. We like this kit because it gives you the effective cleaning power of a direct kit without nearly as much mechanical wrangling involved. You’ll only need the most basic of tools, and there’s much less of a chance for mistakes to be made. However, since you’re not removing the injector, it’s still not quite as professional grade as a full kit. Option 1: Use a fuel-line cleaning solution! This is the easiest, fastest way to go. 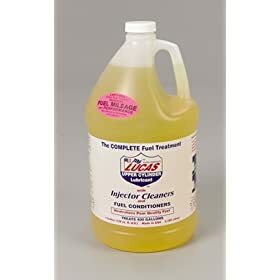 Head over to our main page to find a suitable injector cleaner for your vehicle. Then, once you’ve bought a can/bottle, wait until you’re nearly running on empty. Drive to the gas station, and pour the cleaner into your tank. Fill up as normal. It’s important to add the cleaner before you add the tankful of gas, since the pump will do the mixing for you! Then, drive through your tank. Don’t worry about trying to burn through everything all at once. It’s best to drive periodically, so that the cleaner has a chance to sit and work. Step one is to remove your injectors. You’ll want to start by shutting off your fuel pressure lines. Then, being careful of extra fuel spraying out, you need to disconnect the fuel rail. 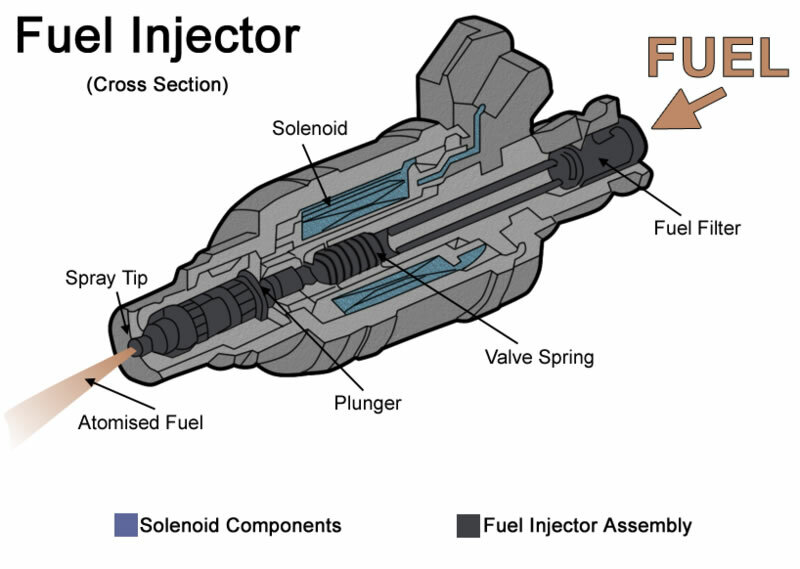 It’s the part that channels fuel to each injector. Start by disconnecting the main fuel line from the rail, then unscrew the rail itself. Usually, once it’s unscrewed, your fuel rail will simply lift off the injector caps. If your car doesn’t have a main rail, you just need to disconnect the fuel line from each injectors. Now you’re ready to take out the injector itself. Make sure you disconnect the wiring first. You should be able to unplug the spring-wire easily with a flathead screwdriver. Then, pull out the injector. This part’s easier if you have a, injector-puller tool in the garage. It might seem like an unnecessary buy, but we always prefer the extra safety. Pulling injectors out with other tools can be risky, and you really don’t want to have to buy a new one. Now that you’ve got the injector out, use some tape to cover the hole. Little parts might accidentally fall in, and that spells instant trouble. Once you’ve covered the holes, take the injectors over to your workbench. Get yourself a nice bucket or tray, that can handle heavy cleaners. You’ll also need some injector cleaner. Instead of pouring it into the tank, pour enough into the container to cover the injectors without wasting too much fluid. (If your injectors look like they need parts replaced, it’s a good idea to take out the old components before you get the whole thing wet). Leave the injectors to soak in solution for a few hours. When you come back, you’ll see some really dirty solution, and you’ll walk away with a very clean injector. Let it dry off, and then you can get your new filters and seals installed. If you’re not replacing filters or seals, you’ll just need to wait for the injectors to dry, and then you’re good to go. Option 3: The second, more professional option, is for the most ambitious home mechanics. In this procedure, you’ll use an injector cleaning kit to test and clean injectors with pressurized solution. We love these kits because they allow you to measure the spray pressure of the injector, inject cleaners at pressure to blast out gunk, and test your injector’s performance before you head out on the road again. This method is a bit more involved, but it does the best cleaning job overall. It has the best chance of improving your car’s performance, and it’s a truly professional-grade service. Because there are so many kits available, we won’t go into too much detail here about how they work. Each kit has its own procedure and instructions, and you’ll want to follow them carefully to do the best possible job. As a general rule, you’ll follow the same steps as we’ve listed above to remove your injectors, then use the pressure tank and hose from your kit to clean and test the injector. Some kits also come with replacement parts or other tools to help you do a full overhaul of each injector. Direct and indirect cleaning methods have their pros and cons, as we’ve seen. You’ll want to consider all the points we’ve discussed in this guide as you decide which method is right for you. Think about your level of mechanical expertise, the condition of your vehicle, and your preferred maintenance schedule. Thankfully, since there are so many options on the market, there’s an injector cleaning solution for everyone! Remember, these different cleaning options aren’t mutually exclusive. For instance, if you’ve got an old engine with really dirty injectors, your best bet is probably to do a full direct cleaning, and then use an indirect fuel-line cleaner afterwards to keep the problem from returning. Or, you could use a fuel-line cleaner with every oil change, and do a direct cleaning every year or two. In another scenario, you might use indirect cleaners for most of your maintenance, but replace the O-ring seals, filters, and pintle caps every few years with a direct cleaning kit. You’ll want to figure out the right choice for your car. Think about your driving habits, your vehicle, and your fuel source. If in doubt–always ask your mechanic! Want to compare more fuel injector cleaners? Check out the best sellers on Amazon! For more reviews, visit our homepage!